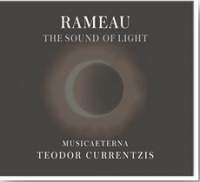 Teodor Currentzis’s effusive dedicatory preface suggests that Rameau’s music ‘radiates the richest Apollonian light. His music travels straight to your heart like a ray of sun cuts through the endless dark space of the universe until it finally hits the human eye, a green leaf, a rose petal. Rameau is the driver of Apollo’s chariot.’ Readers will have to decide for themselves whether these words are wisdom or blarney. The Musette from Les fêtes d’Hébé instantly establishes Currentzis’s penchant for strong textures and vivid moods – but the sabre-rattling aggression of the ensuing Tambourin invites doubts that these impressions are consistent with French Baroque style and Ramellian atmospheres. Currentzis says: ‘I do not wish to produce the most “authentic” Baroque sound’ – and he’s not kidding. Tambourins from Dardanus are peculiarly unplayful without gracefulness, and it is bizarrely wilful to play the Entrée de Polymnie from Les Boréades without rhythmical inégales, diminishing its loveliness into clumpy foursquare tediousness. The grand chaconne from Les Indes galantes is stodgy on account of a forced heroic manner. The Orage depicting rainfall in Platée becomes a horrifying biblical plague. Folly’s ‘Aux languers d’Apollon’ is sung with caustic sarcasm by Nadine Koutcher, although the exaggerated mannerisms mean that the joke outstays its welcome. I am baffled why Aricie’s lonely ‘Temple sacré, séjour tranquille’ manages to seem simultaneously jaunty and perfunctory, although I confess to enjoying the Mahlerian approach to ‘Tristes apprêts’ (Castor et Pollux) – an evocation of the sound of darkness, if there was ever one.